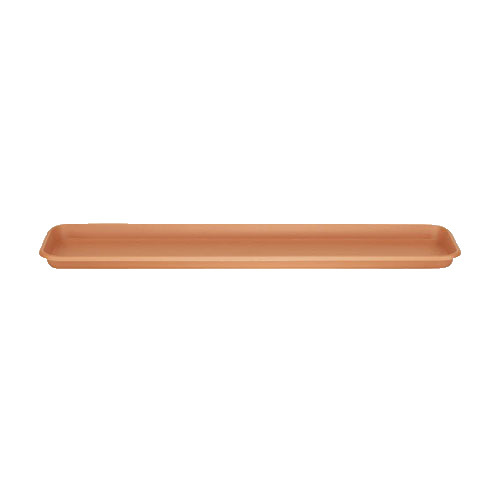 Stewart Garden Terrace Trough Tray 80cm in Soft Terracotta colour is suitable for indoor or outdoor use, either as a water drainage reservoir for a row of flower pots, or as designed to accommodate Stewart Terrace Trough planters. Durable strong plastic construction tray that is both weatherproof and coloursafe when left out in the elements. Tray is self containing without drainage holes and 3cm tray depth ensures non-waterlogging of plants. Made in the UK. Tray measures 77cm top edge to top edge maximum length. Due to rim tapering, the actual tray base length measurement is 74cm, ensuring only troughs or pots with a base length footprint of 74cm or less can sit flat in this tray. Width of tray top edge to top edge is 18.5cm but tray base width is 15cm, ensuring pots or troughs with a base footprint width of 15cm or less can be accommodated. 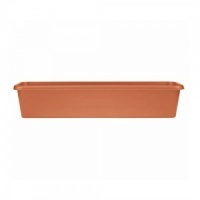 Stewart 80cm Terrace Troughs are designed to fit this size Stewart trough tray.